Nearly a century ago, a British naturalist named Michael Graham completed the first fishery survey in Lake Victoria, the largest in Africa. Graham recommended the establishment of fisheries management authorities that would focus on collecting data on the lake’s fish stocks. Local and international authorities took until the 1960s to implement his recommendations – just in time to start mapping and tracking the rapid deterioration of Lake Victoria’s social-ecological system. Nile perch were introduced to the lake in the 1950s – to boost the lake’s productivity – and their numbers suddenly boomed in the 1980s.1 1. Pringle, R., 2005. The Origins of the Nile Perch in Lake Victoria. BioScience 55(9):780-786 Article link (Open Access) See all references This rapid shift accompanied the loss of hundreds of the lake’s original fish species. Meanwhile, Amazonian water hyacinth invaded the lake, creating mats of floating leaves and flowers that prevented fishing and blocked light to the waters below. Shoreline communities grew as people were drawn to the promise of work opportunities in fishing. With growing population and land clearing, water pollution increased. All of these issues together made Lake Victoria a textbook example of a complex system. The monitoring and development projects in the region, funded by the international development community since the 1960s, still struggle to keep up with the rapid large-scale changes in Lake Victoria’s basin. For example, dagaa, a little sardine-like fish that is now the lake’s second most important fishery, has been officially monitored and managed for decades. Yet, to this day, the trade routes for selling these fish are poorly understood. Despite decades of monitoring, solutions to the myriad pressing social and environmental problems remain mostly short term. That focus distracts from longer-term visions of sustainable livelihoods for all in the lake’s basin. In the end, quick fixes lead to actions without reflection, where success is equated with immediate economic gain or even action for action’s sake. Lake Victoria’s watershed includes five countries, of which only three have direct access to the lake. Map: E. Wikander/Azote. From an academic perspective Lake Victoria has been and continues to be a treasure-trove of knowledge. The ecosystem is held up as an example in many disciplines. Inspired by the rapid pace of evolution here, the Dutch ecologist Tijs Goldschmidt nicknamed the lake “Darwin’s dreampond” in his bestselling book of the same name. The many species of cichlid fish inspired him to compare Lake Victoria to the Galapagos Islands and their finches, with an extinction twist. Murkier waters from pollution, altered habitat, introduced fish species, and increased fishing pressure all worked together to directly and indirectly drive hundreds of cichlid species to extinction. 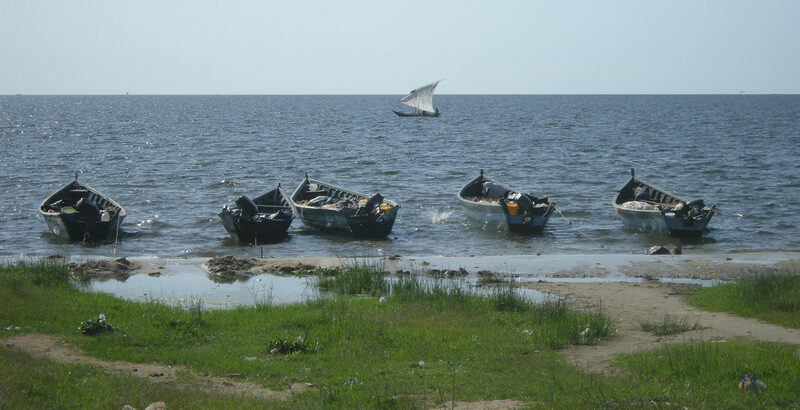 Despite spawning many academic discoveries and successes, scientific explorations of Lake Victoria have not translated to similar successes for sustainable socio-economic development in the region. Even though the Nile perch fishery significantly boosted the lakeshore countries’ GDPs, people in the lake basin still live in poverty, vulnerable to a collapse of the fisheries from environmental degradation and intense exploitation. Mats of water hyacinth block fishers’ access to the lake, as well as blocking light and sucking oxygen from the water below. Photo: Andrea Downing. In 1997, the hopes for applying science-based findings to managing the regional lake basin were high. That year saw the launch of the Lake Victoria Environmental Management Project (LVEMP), the lake’s first transnationally coordinated development project that took a holistic view of the lake. 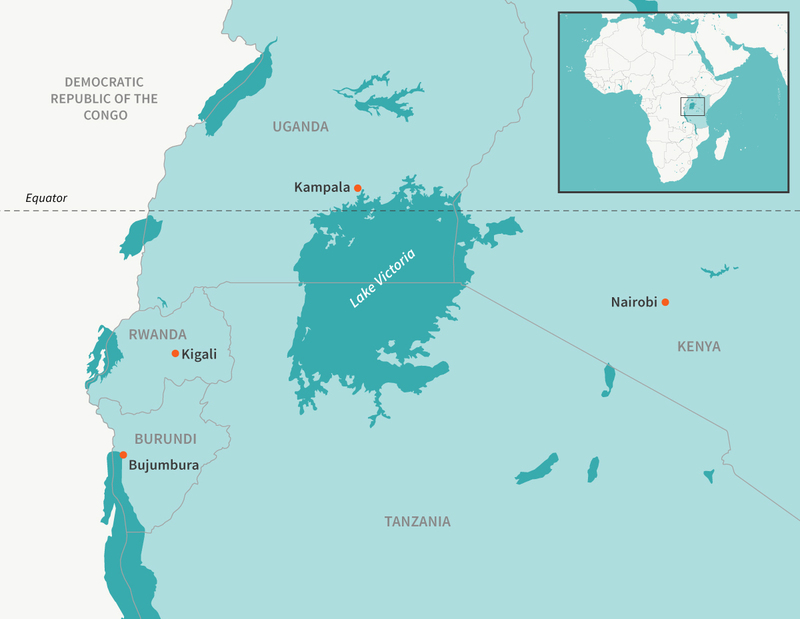 LVEMP covers the lake basin’s five countries: hosted by Tanzania, in cooperation with Burundi, Kenya, Rwanda, and Uganda. As a collaboration between the East African Community and the World Bank, the project was set to last for five years, but was extended to 2005 and followed by LVEMP II, which closed at the end of 2017. LVEMP aimed to complement the existing fishery-centred programs coordinated by the Lake Victoria Fisheries Organisation by taking a whole-basin perspective. The first phase of the project focused on water quality, monitoring, and capacity building for local scientists. The program restored laboratories, analysed past rainfall and climate data, and placed local urban runoff stations to monitor water quality. … projects seemed to address only symptoms, not the bigger picture. LVEMP II placed a strong focus on community participation and livelihood improvements across the basin. Community-driven development projects stem from past successes in environmental protection by communities, which have been found to take ownership of local ecosystems and act as stewards. 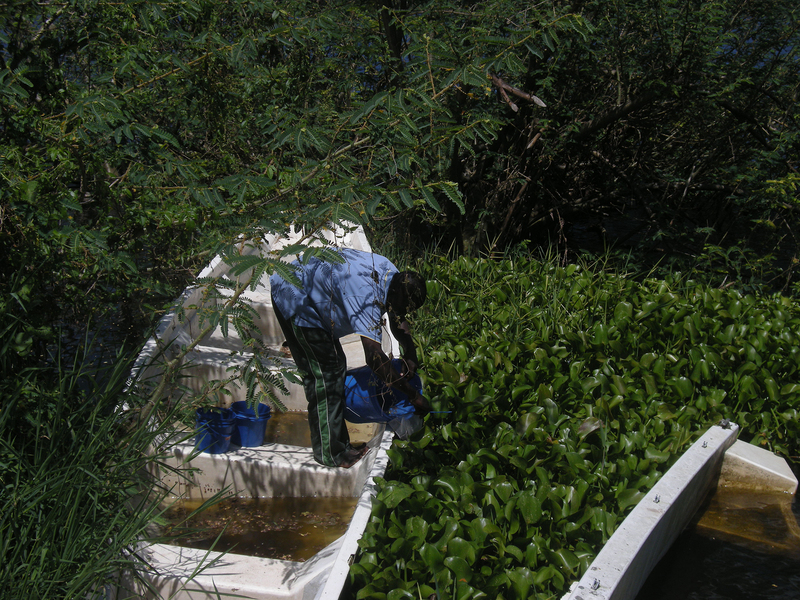 These projects include beekeeping, improved farming, horticulture, and weevil rearing for water hyacinth control. Though LVEMP II’s projects are positive interventions, which address both social and environmental issues, they are small in scope and independent of each other. Impact numbers from the World Bank suggest that only about 1% of the 40 million people living in the basin who depend on the lake’s resources have benefitted from the LVEMP II projects. After nearly 20 years of LVEMP projects, the lake’s water quality is still declining – as are the fish stocks – more markedly than ever. There is no tangible plan B for the people who depend on the lake, its water, and its fish. From current assessments, LVEMP interventions overall seem unlikely to have been sufficient to tackle the ongoing and pervasive effects of pollution, overfishing, and poverty at the necessary scales. The economic profits reaped from Nile perch exports mean that managing for productive fish stocks has always trumped ecosystem and biodiversity management. Revenues from all fish exports are dominated by Nile perch across the three lakeshore countries – Tanzania, Kenya, and Uganda. And they grew from nearly nothing before 1985 to US$100 million (£64 million) in 1995, to over US$400 million (£200 million) in 2008. Such market earnings have largely been perceived as a benefit to lakeshore societies by the people living there and the managers. These revenues are seen as justification for a focus on managing first for productive fisheries in order to achieve sustainable development. However, this inflow of international money has not necessarily improved people’s lives. Money flows into the countries, but the fishers remain poor. Landings of the commercial species – Nile perch, Nile tilapia, and dagaa – were stable until 2010. Nonetheless, fishers had to increase their efforts approximately fivefold to catch the same amount of fish between the 1970s and 2010. Individual fishers – primarily men – landed significantly smaller portions of the fishing pie. 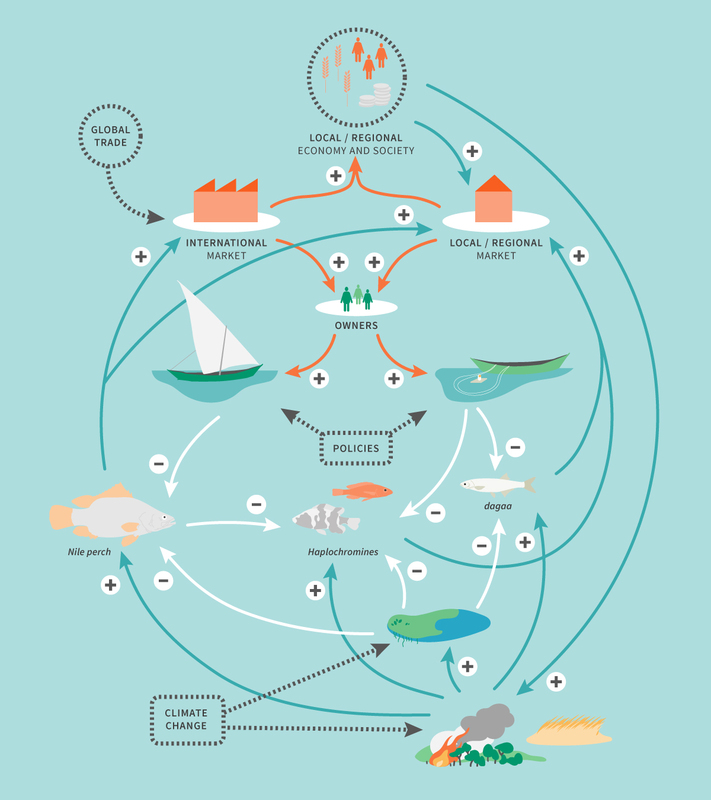 And shoreline communities only got 20% of fishing catches, while the rest was sold internationally – with implications for local communities’ access to good nutrition. 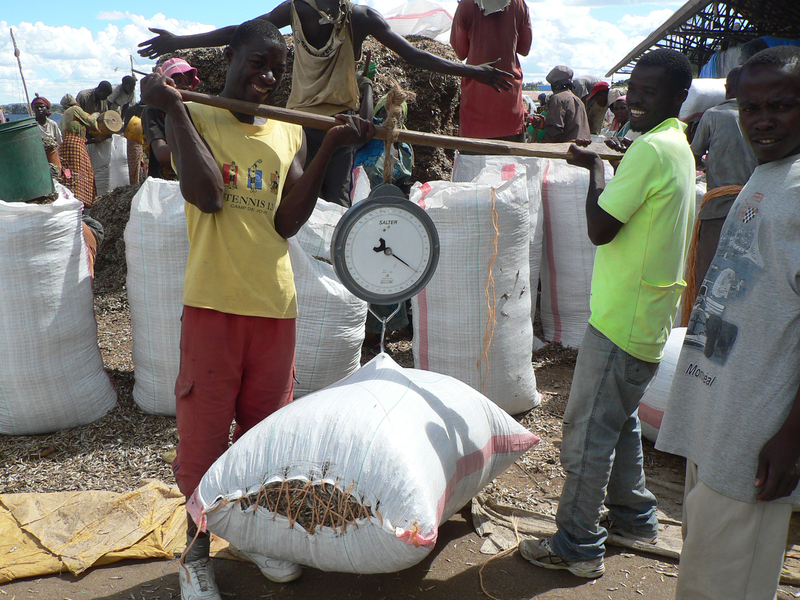 Mountains of dried dagaa are stuffed into 70-kg bags, which are carried across the market onto trucks. Men catch the fish; women dry it and help bag it. Photo: Andrea Downing. The fish-fed boom for national GDPs will not last. Since 2008, revenues from fish exports in the three countries have gone down, as have stocks of Nile perch. That includes a shortfall of hundreds of millions of pounds in the declining fish trade to Europe. Strangely, export values of fish and seafood products have increased from Tanzania to Hong Kong from US$4 million (£2.6 million) in 2011 to US$22 million (£15.5 million) in 2016. The change may be attributable to a new product: Nile perch swim bladders, which are a delicacy in China. Fish bladder sales are not always part of a formalised trade; they are difficult to verify and may not all be legal. When caught for bladders, fish are not processed in filleting factories: fillets are sold on local markets. While the impacts on national earnings go down, the consequences for local communities’ nutrition and income remain unknown. Changes in the traded product, be it fresh fish, frozen fillets, or swim bladders, do not necessarily directly lead to different impacts on the fish stocks themselves. But they can change the socio-economic dynamics of communities in the region, which in turn can influence fishing pressures. The swim-bladder business, for example, requires less capital for entry, in part because there’s no need to follow strict EU hygiene or health and safety regulations. The bladder-gutted fish can be grilled and sold locally by women. However, bypassing the big boats and factories also allows fishers and companies to bypass most fishing regulations, monitoring systems, and sustainability initiatives – for example, eco-certification and fair-trade labels – that were designed around fish destined for European exports. The Lake Victoria system represented here includes international markets, local markets and fishers, the owners of the boats, fishing access points, refrigerators, and more. The entire ecosystem is being affected by climate change, as well as shifts in nitrogen and phosphorus inputs from intentional burns to clear forest for agriculture, and from agriculture itself. The sale of swim bladders and its impacts have yet to be added to this system. Blue arrows show how an increase in one factor causes increases in another, while white arrows show how an increase in one factor causes a decrease in another. Red arrows indicate so-called unit transformations, where currency leads to shifts in fishing efforts. Illustration: E. Wikander/Azote. Source: Downing et al., 2014, footnote 3. These shifts in trade illustrate a sort of “Ponzi-scheme”-like dependence on resources, where supplies are exploited evermore extensively in the promise of providing new or more resources. Resource exploitation seems justifiable to managers when it leads to GDP growth. In reality, overexploitation depletes Lake Victoria’s system. Reduced in its capacity to provide ecosystem services such as clean water, or resources such as fish, it can no longer buffer the shocks and stresses to which all such systems are perpetually exposed. The pyramid is already starting to crumble, as fish catches and contributions to GDP both go down. Short-sighted solutions appear to have solved little when it comes to securing a resilient social-ecological system for Lake Victoria and for the people who depend on it. Evolution in the lake may have been fast, but outcomes of management efforts so far suggest that turning tides on current unsustainable development requires planning for a different time-scale. Fishery managers ask “How much fish can we catch?”, seeking a single number that is easy to implement. Maximising resource extraction does not satisfy people’s needs and aspirations – yet it is the objective of the current Nile perch fishery management plan. Instead, such schemes should implement long-term plans that enable the lake’s societies to be sustainably supported by their environment, even while they are shaping it. Examples from other lakes could provide inspiration for how to create such visions for the future. Imagining desirable outcomes and a method known as “scenario building”, are ways of engaging societies and helping design sustainable management practices, towards more than the exploitation of a single resource. Management planners for the Yahara lakes region in Wisconsin, for example, use such methods to engage stakeholders, and in the end to understand sustainable development as a multifaceted process. Applying what scientists and development practitioners have learned from Lake Victoria, both academically and in practice, will require local cooperation, but also a refocusing of international aid. For now, fishing still brings in significantly more revenue than aid, at hundreds of millions of pounds per year versus tens of millions of pounds respectively – though this can only last if a stock collapse is averted. Perhaps aid should serve to help map out desirable, sustainable futures for the lakeshore communities, pointing at where and how the fishing income could be directed. Graham saw Lake Victoria’s fish and imagined they could support a big fishery. His vision was realised, in the name of development. Today this fishery is close to collapse, perhaps also in the name of development. The questions remain to be asked: What would sustainable development in the lake basin look like, with or without the fish? What does development mean, what does it imply, and for whom? By imagining the answers to such questions, the people affected most can design relationships between their societies and their environment to support such development. Opening image: A dagaa fishing fleet waits to launch when night falls, as another fishing boat plies Lake Victoria. Photo: Andrea Downing.